Whether you're in the process of a DIY pest control project, or just educating yourself on the different types of insecticides out there, one thing is clear. It seems like there's a never-ending stream of them! The newest one on the docket is abamectin. What is this chemical? How does it work? Is it toxic to humans and animals? Stick with us as we dive right in, and we'll uncover all these questions (and more!) in our definitive safety guide. When Should You Consider Using an Abamectin-Based Product? Is Abamectin Dangerous To Humans? Is Abamectin Dangerous To Cats? Is Abamectin Dangerous To Dogs? What Does The Government Think About Abamectin? When a pest ingests or comes into contact with abamectin topically, the chemical begins to break down the insect's central nervous system. While this is the primary end goal of most insecticides, how abamectin works to achieve this goal is a bit different: it penetrates a synapse of the insect's brain that's normally protected by a strong blood-barrier. When this synapse is destroyed, the insect's neural and neuromuscular transmissions are disrupted, leading to a compromised nervous system, paralysis—and—eventually, death. You may not realize it, but there could be some abamectin sitting under your roof right now! Here's a couple of example products that use abamectin as their main "active" ingredient. This insecticide contains its active ingredient right in the name, so it's pretty difficult to miss. Aphids and thrips are nasty bugs that can infest trees and steal the resources leaving them to slowly die. Here's an in-depth video with everything you need to know about this pesticide. Check it out! 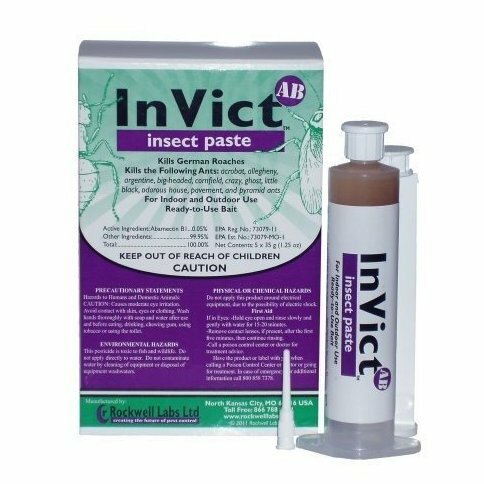 InVict AB Insect Paste is a tube of synthetically-produced gel that is designed to be applied to cracks and crevices where ant infestations are prevalent. This gel is created with a mixture of abamectin as an active ingredient and sweet-smelling attractants to lure ants toward the paste. Once they eat the paste, the abamectin works to slowly break down their neural systems while the ants deliver the poison back to their colonies. 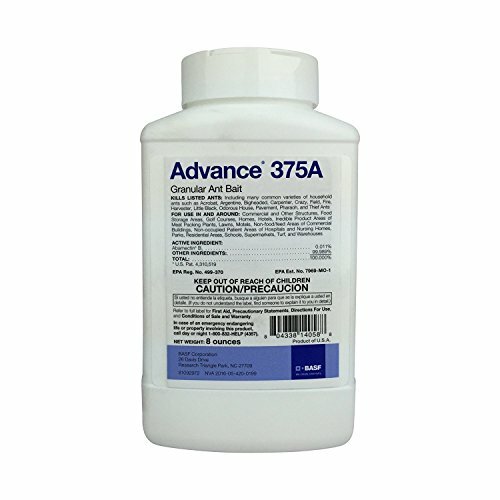 Like the product we just mentioned, InVict AB, the Advance 375A Granular Ant Bait also works to attract and kill ants with a time-release system of abamectin—albeit in a different fashion. Advance's system relies on granules to discharge abamectin in a slow-release format. This product works to eliminate worker ants over time, and immediately halts egg production in the colony, which weakens the colony's overall strength and causes it to collapse. At this point, you're probably wondering if abamectin is an appropriate insecticide for your situation, right? What makes this type of insect-killer better than others? Anyone with a carpenter ant infestation understands the gravity of the situation: you've got to take care of that problem, and you've got to take care of it fast. This is where abamectin comes in handy: because it works so well on the ant species, carpenter ants will eat bait gels and granules containing this type of poison and spread it throughout their colonies—unknowingly detonating the colony from the inside. Did you know that ants feed the entire colony by eating food in the outside world and regurgitating it for the larvae, soldiers, and queen back at the home base? For this reason, bait gels containing abamectin are immensely effective: because adult ants are reluctant to eat solid food, they chew on the chemical-filled gel. In turn, they take it back to the other members of their colony, infecting them with the poison as well. Before long, the entire colony has imploded due to the presence of abamectin. Even more beneficial than its uses on ants is abamectin's efficacy against predatory mites: this chemical can target a wide span of different types of mites, and is marketed across the board an effective miticide. Its effectiveness lies not only in its success rate, but also in the fact that abamectin has translaminar properties. For those of us who aren't scientists, this means that the chemical forms a reservoir in plants where it's applied and works for weeks in the future. Its residual power keeps on killing the mites, meaning that reapplication isn't necessary and that mites won't return. If abamectin is such a powerful poison to ants and mites, what could it possibly do to humans? Is it safe to use during pregnancy, and what about if you've got babies or young kids in the house? Though this insecticide is highly toxic to the targeted pests, its efficacy decreases substantially toward mammals. This doesn't mean, however, that mammals are immune to danger when exposed to abamectin; check out the sections below to get a feel for how this chemical can pose a threat to humans. Abamectin is shown to be lethal to humans only in extremely rare circumstances. However, please keep in mind that these were laboratory tests with extremely high amounts of abamectin. For example, the most concerning toxicity levels were reached by those who ingested a span on 67 mg/kg to 227mg/kg of abamectin, which is far more than an accidental topical contact you'd experience at home. Any Risks For Pregnant Women? While there is no scientific or medical evidence that suggests that abamectin is harmful to human pregnancies, there are scientific studies which point to birth defects in rats that were exposed to this product during pregnancy. The study goes on to say, however, that it is unlikely that other population subgroups and species are affected by this chemical. Any Risks For Babies and Toddlers? There are no specific studies mentioning abamectin's toxocity toward babies and toddlers, but bear in mind that smaller bodies (not to mention curious explorers) will always be more susceptible to the effects of a pest control substance, no matter which one. 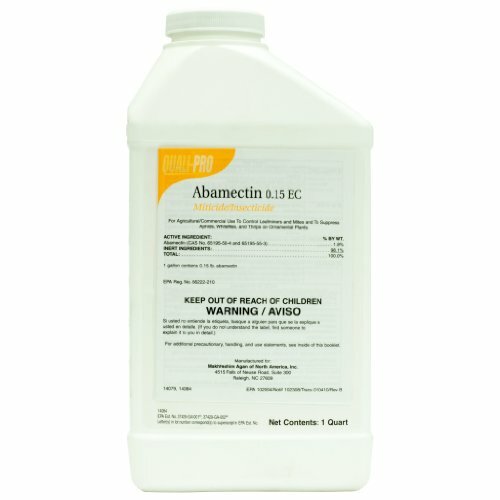 According to Penn State Extension's Toxicity of Pesticides register, abamectin must be ingested at a rate of 300mg/kg or topically applied at less than 1800mg/kg and left untreated for 12 hours in order to become lethal to an adult. With statistics like this, it's impossible to miss the signs of an abamectin poisoning in your child. You'll be able to know well in advance and get your baby or toddler the necessary emergency medical care required to save the day. Just because abamectin has a lower toxicity rate toward mammals doesn't mean that your cat won't be affected by a run-in with this chemical. However, that doesn't mean you're out of the woods just yet. Make sure that you're storing your pest control products properly so that your cat doesn't stick its nose where it doesn't belong! Some vets recommend formulations of avermectin (a synonym for abamectin) to treat fleas in cats. However, this can be problematic, as an overdose can quickly escalate into severe health problems for the cat. In addition to the side effects (which are discussed in detail below), an in-depth study recently revealed that the avermectin formulations are not strong enough to fight off the cat fleas, essentially only putting the cats at risk for poisoning. Unfortunately, dogs are particularly sensitive to abamectin. Despite the fact that most dogs have larger bodies than cats (and should therefore be more resilient to the effects of an outside substance), dogs have a special gene mutation which makes them vulnerable to this insecticide. Because of the arrangement of their genes, you'll be hard-pressed to find dog products containing abamectin. This is why you should ALWAYS use pest control products according to their labeling. If this pesticide has the capability to harm dogs in such a way (while posing such little threat to humans), what does the federal government have to say about it? The Environmental Protection Agency lists avermectin as a registered pesticide of of 18 April 1986. Since the publication of this pesticide's fact sheet, several memoranda have been made available for public viewing regarding the safety of abamectin in drinking water, fruiting vegetables, and soil. While the Centers for Disease Control list no articles or links to any directly-related abamectin content, there is an article on their website which notes the case of workers on a farm who were exposed to abamectin (in addition to other pesticides) and fell ill as a result. The article does not point to abamectin as the absolute cause of the illness, nor does it confirm that this specific pesticide was not the culprit. So, what makes abamectin different from the other pesticides out there? When you're reading label after label, product description after product description, it can seem like all the bug-killers are doing the exact same thing: killing off the nerve systems. Check out how other insecticides are getting the job done in other ways, and how they differ from abamectin. Fipronil works mostly in the same ways as abamectin—that is, to shut down an insect's central nerve system. One key difference between these two chemicals? Fipronil has made a name for itself as a pet medication. It's synonymous with Frontline and Frontline Plus, which are famously used to treat fleas and ticks on dogs and cats. As you've just learned, you're not going to want to put abamectin anywhere near your dog, and probably nowhere near your cat, either. Inxocacarb was developed to act slowly, killing ants and other colony-dwellers like a ticking time bomb. This insecticide has a low acute toxicity all the time, a fact which can never be changed. Abamectin, on the other hand, can switch things up. Depending on the insect you're trying to target and the form you use for the insecticide, abamectin can be either slow or fast-acting. You've got a lot more flexibility with this time of insecticide, which can make it a much better choice. Here's the bottom line about abamectin: it works...albeit sometimes a little too well. You'll be able to knock out your ant problem, any predatory mites that are hanging around, and even take a swing at termites! However, if you're a pet owner, this probably isn't the pest control product for you. The side effects to cats are concerning enough, but the detriment to dogs are absolutely heartbreaking. If you've got small children and babies in the home, as always, exercise caution and keep all pest control products on high shelves where the kids won't be able to reach. Always read product labels and obey all warnings set forth on the description, using the product as directed. In short, abamectin should be able to kill your ants, mites, and all the other creepy crawlies lurking in between the cracks.